Do you have a good idea to help save the planet and save yourself money at the same time? 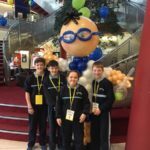 We are two students from Bridgetown National School and have come up with a great community-based idea that does just that. 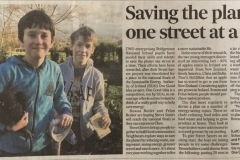 We are Rowan Butler and Felan Becker, in 5th class, and have entered our idea in Sustainable Energy Authority Ireland’s (SEAI) National school competition “One Good Idea” to come up with a good idea to help save energy and tackle climate change, and are one of only 20 primary school finalists nationwide. 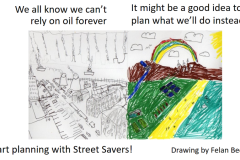 Our project is called Street Savers, and brings together neighbours to explore ways to save the planet by reducing waste, saving water, saving energy and greener travel. We recognise that even with the best will in the world it’s hard to change our lifestyle, but with the support of others it’s easier to make changes and keep to them. 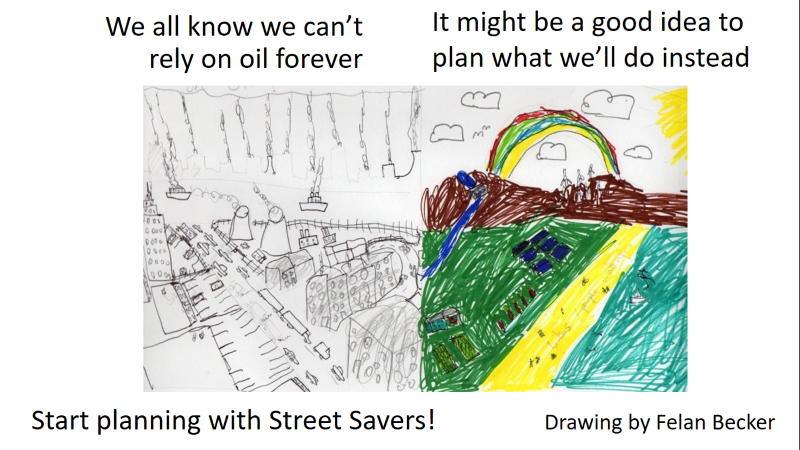 We all have different skills, and Street Savers offers the chance to share our skills with each other. For example, someone may know how to grow vegetables and another how to mend clothes or mend bicycles. 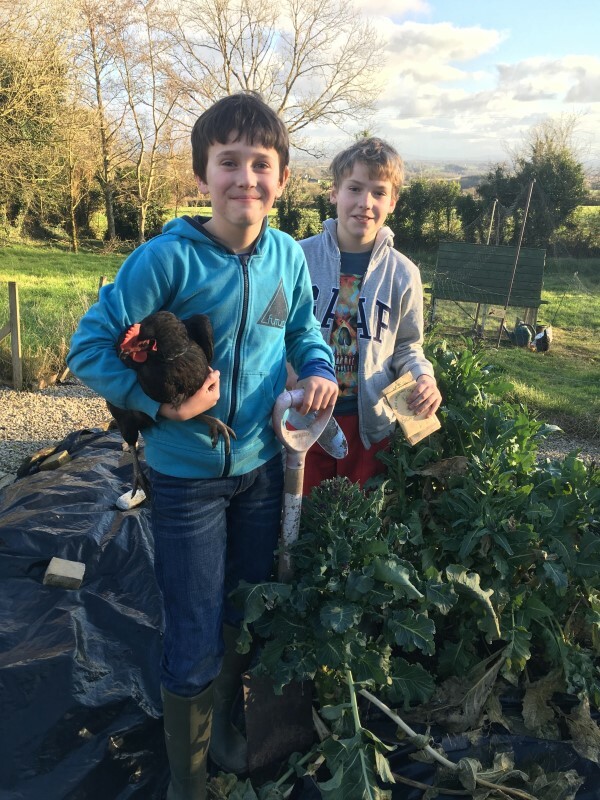 It’s all about helping each other to save the planet, and money! To kickstart our campaign, we have come up with some fun challenges to show us how much energy we use. The distance that food travels from where it’s grown to your plate is called food miles. It also includes the travel of food to be processed. Bringing it to Ireland by air, train or ship uses a lot of fuel, and burning diesel and petrol produces lots of greenhouse gases: these are very bad for our planet. Transporting food around the UK (according to DEFRA) represents nearly 25 per cent of all the trips made by heavy goods vehicles on the country’s roads, and adds up to around a huge 20 billion miles a year. That’s an awful lot of fuel! The percentage of trips in Ireland will likely be very similar. FOOD WASTE: don’t buy more food than you need, this reduces how much food you throw away. When you open your fridge, the cold air that keeps your food fresh escapes and is replaced by warm air from the room. Your fridge’s compressor has to then drive the warm air out and bring the temperature back to normal, increasing your energy bill and also your environmental footprint. BUT don’t leave the door open for a long time: it is better to open and close it to get your milk for your cereal and then open and close it again to put the milk back, than to leave it open while you are pouring your milk on your cereal. Don’t put hot foods in the fridge until they are cool. Part of the way that your fridge works is by using the cool food items already in it to keep it cold. If you put a warm dish of food in there, it makes all the food around it warmer and the inside of the fridge warmer, increasing your overall energy use. OTHER WAYS TO SAVE ENERGY IN YOUR HOME! turn that little red light off! •	See how many cars the group can keep off the road for a week, by shopping together and carpooling, more fun too! 1. It saves money, you can share the cost of fuel between the passengers. 2. Carpooling cuts down on the numbers of cars on the road. Fewer cars means there is less pollution and greenhouse gases getting into the air. 3. It’s a good way to get to know the people you go to school with or work with or go to afterschool activities with. If you carpool by using an app you can get to meet new people. 1. Try to use public transport more, or better still cycle or walk! In the countryside public transport is not very frequent, so carpooling is a good solution. 2. Think of having a holiday that uses just your car or a ferry, because flights use a huge amount of fuel. If you do fly, try to find a non-stop flight. Most fuel is used in take-off and landing so it’s good not to have connecting flights. •	Use water from a bucket for a day to see how much you actually use. This is quite tricky, you can’t have a shower but you can wash from a bucket! 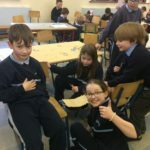 Irish people consume about 150 litres of water each day, which is almost two full bathtubs of water each person every day. Fresh water is limited (most of the water on our planet is salt water). To get clean water, it must be processed and that requires lots of energy. So, it’s good to reduce the amount of water we use. Knowing how much we use is good to know. Irish Water say that cutting your shower time by one minute could save up to 9,000 litres of water a year. 1. Don’t have leaks: fix dripping taps and pipes. 2. Don’t let the tap run: brushing your teeth with the tap running can use up to six litres of water per minute. 3. The average bath uses 80 litres of water compared to an average shower using 49 litres. 4. A third of all water used in the home is flushed down the toilet! Put a displacement device (like a hippo bag) in your toilet cistern to save water. Or a brick will do! 5. Don’t forget to collect rainwater. You can use it in your garden. We hope you enjoy trying out these challenges for yourselves!